Oh Electronic Software Association, you’ve given me an early Christmas present. The ESA is the foremost data collector of statistics and data on video game consumption, usage, and attitudes. Annually this blog reports on their essential facts about video game consumption, but today they’ve released a special report on their findings on how politically engaged gamers are. They’ve created a easy to read infographic of all of these statistics that I will be pulling from. Now that were are officially a year away from the 2016 election, such statistics are as timely as ever. Spoiler alert: Most gamers don’t think America’s leadership is a monarchy ruled by Princess Zelda. The results are overwhelmingly positive: gamers are very politically engaged. In a survey that asked whether or not they would vote in the 2016 election, 80% of gamers said they were going to exercise their right to vote. This is in comparison to non-gamers, which had a percentage of 75% respondents saying they were going to vote in next years election. Lastly the survey looked at what gamers think about specific issues. 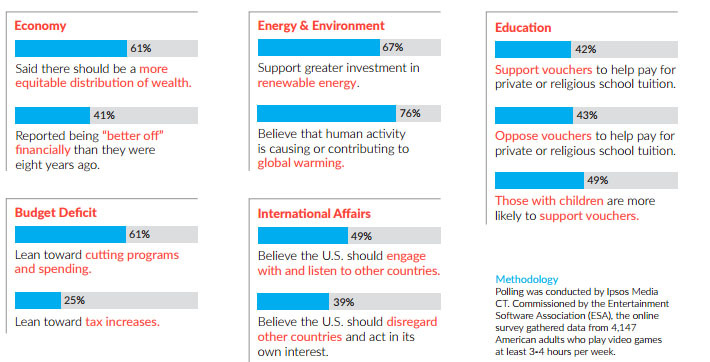 There’s some really interesting insights into how they fall on issues and this is really one of the first studies to actually ask these specific questions. 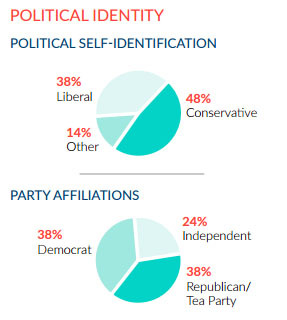 Despite the majority classifying themselves as “conservative” their political leanings on issues definitely have some socially liberal slants. With the statistics out of the way, we can hypothesize as to why gamers tend to be more politically active than non-gamers (or at least say they are). It could certainly have something to do with their connection to online communities; video game communities are gathering places for people to discuss on-going issues. Places like NeoGaf’s off-topic forums ignite intellectual debates in their threads, and this creates public awareness for issues people may not typically come across in their daily lives. Whatever the reason for this political engagement, it’s a beautiful thing to see gamers getting politically active. There are issues out there that concern all gamers; A more politically engaged community is one that has a greater voice. Not to brag or anything, but I’ve been saying that for years…Yeah, I’m cool. Please head over the ESA website and support this type of research. We need more of this stuff, it really does make for a more educated and informed video game community. This entry was posted in gaming, Politics, video games and tagged esa, Gaming, politics, Research, sociology, study, Video Games. Bookmark the permalink. Great post, and good on gamers for being politically informed. At first, I was a little surprised when I read that gamers have a bit of a conservative bias, but it makes sense the more I think about it. There are many instances of gamers reminiscing about the old days when games were actually good. It’s a world that never existed; there were plenty of awful games made back then. Unless a game was particularly bad, we wouldn’t hear about it (and sometimes, not even then). Now if a game is horrible, we’re informed of that fact and it makes it seem like they’ve gotten worse as a whole, when in reality, we’re more knowledgeable. I personally do not miss the days where I could pick up a clunker just because the box or name looked cool. There’s also the fact that rehashes and games in established genres tend to sell better than ones that show any degree of innovation – like how New Super Mario Bros. Wii sold more than Super Mario Galaxy despite the latter contributing far more novel ideas. It’s not encouraging the big-name developers to think outside of the box, so it’s not an attitude I’m sympathetic towards. Also, I am a gamer and I have voted in both presidential elections I could. You can count on me exercising that right every time.